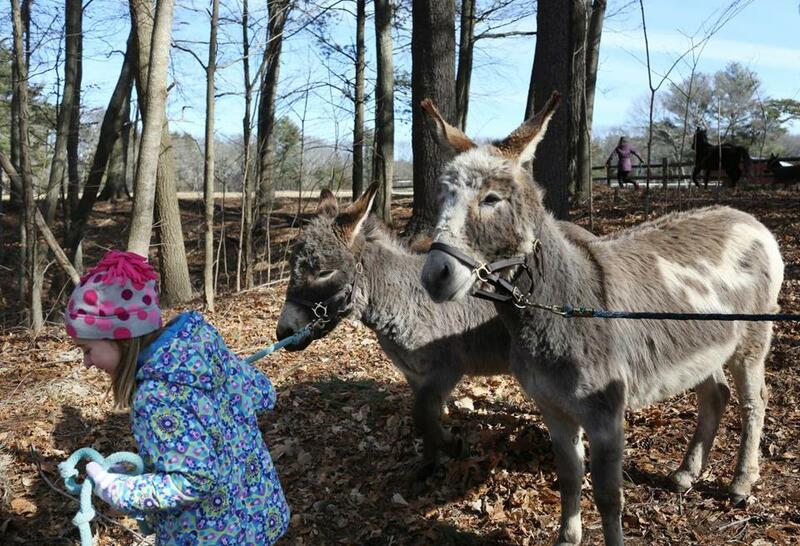 Humans and donkeys shared a stroll on Sunday, organized by the Equine Rescue Network. HAMILTON — Miniature donkeys and horses gamboled through a sunlit winter landscape Sunday morning, over dry grass, fallen leaves, and frozen puddles alongside excited children and their laughing, chattering parents. The innocent gaiety of the moment — the emotional ties among the people, the gentle creatures beside them, and the surrounding rolling hills and forests — stood as a dramatic contrast to the events of one year earlier, and served as a balm for those still grieving. 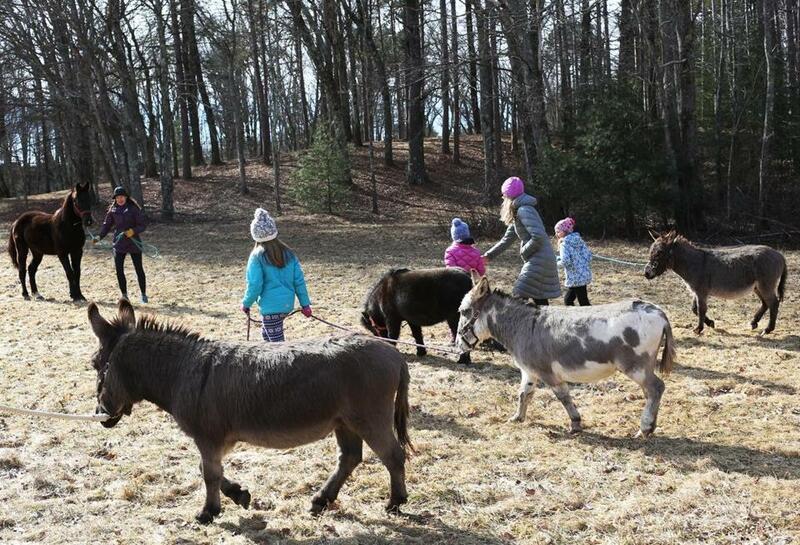 Volunteers with the Equine Rescue Network gather weekly for this “donkey walk,” which helps the animals exercise and bond with the humans who care for them. Sunday’s walk, on the anniversary of Olivia Bergstrom’s death, was dedicated to a young woman who devoted much of her short life to the horses she loved. Bergstrom, 20, was found the evening of Feb. 10, 2018, stabbed to death inside the Needham apartment she shared with her boyfriend, Benjamin Walsh, then 24, who allegedly killed Bergstrom before attacking his parents inside a Millis restaurant. His father, Mike Walsh, said after the attacks that his son struggled with mental illness and substance use. Benjamin Walsh was held without bail and is being treated at Bridgewater State Hospital, said a spokesman for Norfolk District Attorney Michael W. Morrissey on Sunday. Bergstrom’s father, David Stoffregen, and other members of their family were among those walking with the animals on Sunday. Stoffregen said his daughter had been “a horseback rider and avid equestrian.” Their family became involved with the rescue network after her death, he said, donating money to support the organization and volunteering to help tend the animals. “It’s our way of connecting with Olivia,” he said. Stoffregen declined to speak at length, saying the day should be focused on the organization — which buys and finds homes for horses, donkeys, and mules headed for slaughter — and its founder, Janine Jacques. Caroline Fauci, 8, of Hamilton served as a guide. Jacques founded the organization a decade ago, building upon a lifetime of horseback riding and loving equine animals. It rescues animals nationwide, mostly from Texas, Louisiana, and Pennsylvania, she said, paying roughly $600 to $800 for a horse and about $300 each for the donkeys, whose hides are prized in China. A professor at the New England College of Business, Jacques works with animal lovers locally and nationwide to board the horses and donkeys, provide food and medical care, and find foster homes and permanent placements. “It’s all about the relationships I’ve created with people that are like-minded, that are interested in helping,” she said. That includes Bergstrom’s family and friends, she said, whose donations saved more than 30 animals. Some become service animals for injured veterans and others with disabilities, and some will be used as therapy animals for a program that Jacques is developing with psychotherapist Suzanne MacPhail, who works with Bolton-based Cultivate Care Farms, an animal-assisted psychotherapy program. “It’s a very neat thing to be able to save these animals and give them a purpose, as well as using them to help work with people . . . who have trauma,” MacPhail said. To help raise awareness and funding, the Equine Rescue Network will host the premiere of a “DONKumentary” film it has produced on April 20 at Witch Hill in Topsfield with a Hollywood-style red carpet. There were no flashbulbs popping or elegant designer gowns to be seen on Sunday, as volunteers traipsed through mud and muck while becoming acquainted with the animals’ personalities. Eloise, a miniature horse that was recently rescued, has a gentle nature but was bewildered when offered a carrot; apparently her past life included no treats. Romeo, a gelding who nonetheless seemed determined to live up to his name, was one of several males interested in getting to know Eloise, the lone female in the group. Marianne Hartmann, a school nurse from Swampscott, said any time with the animals is therapeutic.